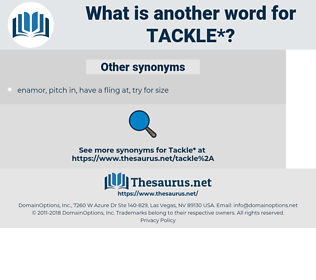 What is another word for tackle? articles, Strikes, sections, items, address, combat. deal, face, manage, address, approach, meet. 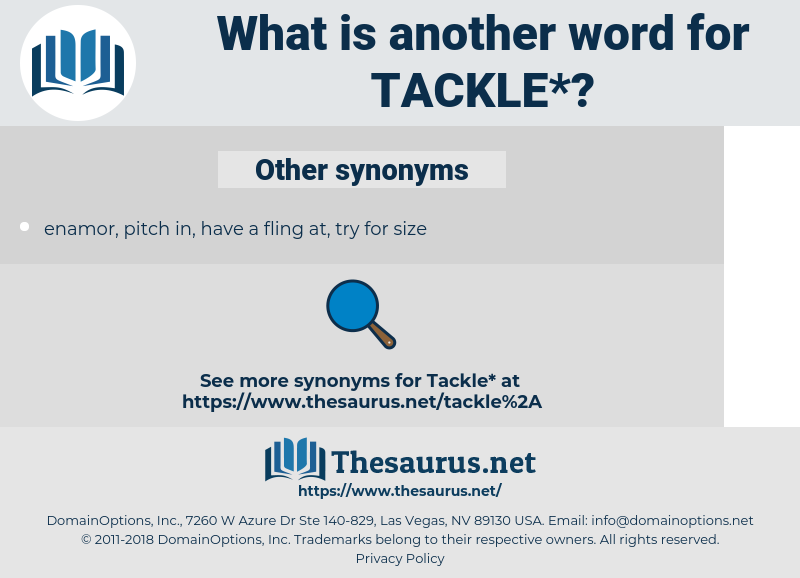 Addresses, Grips, cope, meeting, deal, face, rectify, accommodate, withstand, manage, prevent, address, stop, examine, approach, stem, Addressing, meet, halt, mitigate, challenge, avert, fix, apprehend, curtail, answer, remove, intervene, grasp, pursue, wrestle, intercept, delete, regulate, deter, relieve, touch. handle, eliminate, eradicate, alleviate, grapple, attack, correct, contend, ameliorate, defeat, surmount, combat, compensate. hold, let go, receive, free, be immune, give, protect, help, misunderstand, lose, liberate, fail, unfasten, release, continue, offer. forget, abstain, be lazy, neglect, avoid, idle, complete, conclude, end, finish, dodge.
" Ah," he said, " we'se never ha' no words if ye tackle me this gate. He put down the gun then, convinced that if the spies had been hanging around, they would know now that he was ready for them, and would not dare tackle him that night.